Bietigheim/Los Angeles.- Robert Wimmer literally went through hell during the Badwater Ultramarathon. This footrace with its 135 miles nonstop through Death Valley in the USA is rated as the ultimate trial as far as ultramarathons are concerned. In the German contingency Wimmer finished first. Not only that. In overall ranking he was placed ninth, which means that he is among the International Top Ten. All in all, it took him 36 hours, 53 minutes, eight seconds to cover this lunatic distance from the lowest to the highest point above sea-level in the USA. Roughly 80 extremist sportsmen took part. The race was divided into three groups. The groups started on the 12th of July 2004 at intervals of two hours right in the middle of the Death Valley salt desert. Our man Wimmer running as number 34 is highly motivated. His torturous ordeal against death comes in group three, which is assessed as the group of the best. This arduous race knows no mercy. 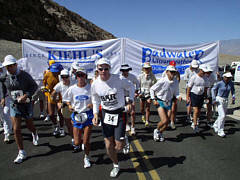 Even before the beginning of the Badwater Ultramarathon many participants cut their shoes open at the toes in order to help them avoid pain, blisters and worse. Thanks to being endowed with the best possible shoe Wimmer does not have to do this. Nevertheless, almost 24 hours after his start Sebastian Bär has to perform an emergency operation on Wimmer’s right foot to treat three enormously swollen blisters, caused by 80° Centigrade temperature on the asphalt and dripping wet socks. The tremendous shock five hours after his start: On the gleaming hot asphalt road Wimmer is hit by a car. A British tourist has not noticed the runner. He hits Wimmer at the hip with his rear view mirror which is wrenched off by the sheer force of the collision. Wimmer temporarily loses control of his running rhythm. Fortunately, there is nothing else but bruises to complain about. And yet, his "psychic run” is severely interrupted. Will Wimmer make it or will he give up? The supply vans of the later overall winner and that of the BÄR® team keep swapping first place. And although the atmosphere throughout the entire race is incredibly tense, the teams show fairness and respect for one another. Wimmer is 100% supported by his team at all times. Every mile he is given special food and liquids by the supply crew, such as electrolyte drinks, water, babyfood or a gel with carbohydrates in order to enable him to be at all capable of surviving such inhuman conditions. And in spite of his running smoothly like a machine, this marathon challenges him to the utmost. Moreover, Wimmer is used to running. Partially walking long distances is a problem for him. During this gigantic race through Death Valley air temperatures of up to 60° Centigrade are recorded. This crazy course across two mountain ranges knows no mercy. It is a murderous run against one’s self and against incredible temperatures. There simply is no shadow in Death Valley. The USA and Canada share the victory. Dean Karnazes from the US comes first (27:22:48), followed by the two Canadians Ferg Hawke (27:30:20) and Monika Scholz (29:22:29). To have a woman come in third place comes close to a sensation. The main message for many of the participants is to ‘just finish‘ the road out of hell. However, Wimmer wants more, far more. And he has indeed reached his goal in spite of all obstacles. Granted he has not been able to meet the time span he was aiming for of less than a day. But none of the experienced runners of the deadly route ever managed it either. There is no way that a man could cover these torturous 135 miles through the desert in less than 24 hours. Wimmer’s personal victory is also that of his team. He is the best German to have run this year’s Badwater Ultramarathon. Not only that. He is also among the top ten of the international ultra running elite. And who knows where he might have ended up had it not been for the British tourist who hit him in the side, thus putting him out of action for some time. Wimmer certainly has more than deserved his "Badwater belt buckle”, awarded to every runner finishing in less than 45 hours. And by the looks of him he will not be stopped in the long run from aspiring to even more seemingly lunatic heights in the running field.